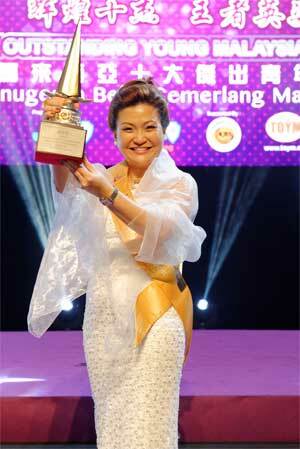 Law receives her TOYM trophy in Penang. THERE is something humbling in speaking to someone who dedicates her life to helping others. Local entrepreneur Esther Law may appear every inch the glamorous and successful career woman, which she is, but once you get to know her better, you realise she is truly a woman of substance who has a deep love for life and people around her. 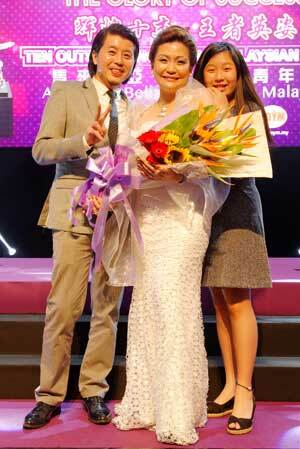 Having very recently been named the recipient of the coveted Junior Chamber International (JCI) Ten Outstanding Young Malaysian (TOYM) Awards 2014 under the Personal Development/Achievement Category, the Lundu-born Law believes the winning is her calling to continue helping and inspiring others. She told thesundaypost how it all started and what direction she is heading to in an exclusive interview. Q: Describe your feelings when you were named one of the honouree of the JCI TOYM awards. A: I’m very happy to be named among the winners. I never thought I’d win as it was quite challenging. 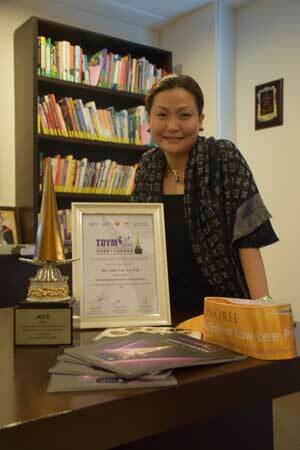 It was a fulfilling experience to be given the chance to hold the TOYM trophy. I feel very blessed but I believe the blessing comes from the hard work and effort I put in. Q: Why did you choose to submit your profile for the Personal Development-Achievement Category as there are many other categories, including Business and Entrepreneurial Achievement? A: For the past 10 years, I have been helping cancer patients. I believe that is my calling to share with others on what options they have besides death, when facing such situation. I may not have a medical background, but I kept learning, researching about methods to help others achieve better lives. The more I got into cancer education, the more I got to know patients and their family members, it was then I knew it is my lifelong mission to help them. It is my responsibility. I told the award judges, my main purpose was not to get the trophy but for a third party to judge where I am standing. Whatever industry I am in, personal development is something compulsory to go through. Q: What got you interested in cancer education and cancer care services? A: My own mother suffered from cancer when I was young. It was a fearful experience. I am glad she went to China for treatment. Because of the successful treatment, I am very impressed with the medical industry in China, despite the popular belief that they are not good. Q: What are your personal strengths and weaknesses? A: When evaluating myself, I always use the SWOT (Strengths, Weaknesses, Opportunities, Threats) Analysis. It is a very important tool to look at oneself. I would say one of my strengths is sincerity as I believe in being authentic. When you are yourself, only then you can learn more and find ways to overcome weaknesses. My weakness is not acquiring enough knowledge. I feel there is always room for improvement in everything I do. Winning the award is just part of Law’s lifelong mission in helping others. Q: Would you consider yourself as a perfectionist? A: I request a lot from myself, not others. I want to do the best. I don’t mind if others are not doing the best as nobody is perfect. Mistakes are chances for self-realisation and learning. I think I see life in a different way after dealing with so many cancer patients in my work. Q: Having won TOYM awards, what do you think of the youths in general these days? A: Youths today take many things for granted. It’s not because they want to be so but because they are taking things as fed to them by their parents. They think they should be served first and that’s something that they carry from childhood to adulthood. Youths should be guided the right way. However, discipline of children cannot be too harsh or else they will compare themselves to their peers and think that their parents love them less. I think parents need to break through certain patterns so that their children do not grow up to take things for granted. Q: Is it possible to be a successful career woman yet having a happy family life? A: Absolutely. Women should not think it is not possible for a career woman to have a happy family. It requires effort but you can have both a successful career and a happy family. Q: What is your future direction in this field? A: I will continue to focus on cancer education. In the past, we did not have enough information when it comes to treatment options and cancer care services. Now we are overloaded with information. This is where cancer-stricken patients and their family members need to be properly guided in their choice. People will ask which is the best hospital, what is good treatment? In order for them to get their answers, they must go through proper selection. Many patients are misdiagnosed or given the wrong treatment. With my links to various hospitals, I’m able to provide adequate advisory services to patients so that they are able to make the best choices. Law is the founder of Excellence Medicare Information Centre and the author of two books — ‘Gateway to Life’s Values’ and ‘My Life Mission over Cancer’ (in Chinese). She is happily married to husband Jeffrey Siaw and they have a daughter Natasha. Law shares her success with Siaw and Natasha.